With its stunning visuals, the Xbox One X is the closest thing to a good PC gaming experience in console form. But is it worth a £100 upgrade? Four years after the launch of the original machine, Microsoft’s Xbox One family is now finally complete. Although the Xbox One X has been hailed as the most powerful console ever made, it very much remains an Xbox One derivative, running all the same games and working with all the accessories with no Xbox One X exclusives. What you get is improved audio-visual performance – rather like the difference between playing a PC game on a regular mid-range home computer versus a high-end gaming monster. Greater power hasn’t meant a giant form factor though – this might be one of the least conspicuous consoles in history. Reverting to black after the refreshing “robot white” colouring of the Xbox One S, it’s a truly minimalist slab of modern consumer electronics design taking up less space than any previous Xbox iteration. Microsoft claims to have employed cutting-edge engineering techniques to achieve its sleek form factor, including a vapour chamber cooling system, which has led to an impressively quiet machine. During gameplay, there’s little more than a gentle hum coming from the unit – comparing well with the PlayStation 4 Pro and previous Xbox machines. Also onboard is a new HDD for faster loading times (though we’re talking seconds here), along with three USB slots, and the standard optical, IR Blaster and HDMI in and out ports. But is it really 4K? The major reason to buy an Xbox One X is its excellent UHD/4K performance, which is unparalleled in the console sector. With an eight-core 2.3GHz CPU and six teraflops of processing power, it can achieve native 4K game visuals, which means a screen resolution of 3840 × 2160 pixels at frame rates of up to 60fps (frames per second), as well as higher quality textures and smoother rendering. Take a Porsche 911 GT2 out for a spin on the legendary Suzuka circuit in Forza Motorsports 7 and you get a thrilling taste of what this means – superlative texture detail on the car models and scenery, gorgeous lighting and reflection effects and astonishingly fluid movement. There are times, especially in wet, overcast weather, when the experience hits genuine photorealism. It’s very unlikely many games will aim for this fabled performance benchmark however. We’re already seeing titles offering players a choice between visual fidelity and raw performance. Gears of War 4, for example, lets players select between performance mode and visuals mode, the former runs at 60fps in 1080HD, while the latter halves the frame-rate but quadruples the image resolution to 4K. Titles such as Rise of the Tomb Raider and Middle Earth: Shadow of War offer similar options. In this way, the Xbox One X really is replicating the PC gaming experience where players have much more control over their performance ratios. Elsewhere, you’re getting all the contemporary visual features we demand these days without truly understanding, such as wide colour gamut and high dynamic range lighting (although Xbox One S does too). Just load up Assassin’s Creed Origins to see what this means: vibrant panoramic desert scenes, lit with intense sunlight that glints off golden armour and casts long shadows over the terrain. What about the PlayStation 4 Pro? On paper, the PlayStation 4 Pro is less powerful than the Xbox One X (2.1 GHz processor, 8GB of RAM and a meagre 4.2 teraflops of processing power – what a wimp). However, it does have titles running at native 4K, albeit at 30fps, and also makes smart use of a technique known as checkerboard rendering to mimic 4K resolutions, which can be pretty indistinguishable from the real thing. For casual users then, big titles like Destiny 2, Fifa 18 and Assassin’s Creed Origins look very similar whichever console you go for. At the same time, key PlayStation exclusives such as Uncharted 4 and Horizon Zero Dawn are as graphically exquisite as anything running on Xbox One X. If you love your PlayStation and want to play games like Uncharted, Last of Us, God of War and Death Stranding, rather than, say, Sea of Thieves, Halo, Gears of War or Forza, the impetus really isn’t there for most people to make the switch. Those at all interested in virtual reality should be aware that, unlike PlayStation, Xbox One still lacks its own headset, and there is nothing on the horizon (though a derivative of Microsoft’s Hololens mixed-reality tech has been rumoured). What the PS4 Pro doesn’t have, however, is a 4K Blu-ray drive, which comes standard with the Xbox One S and Xbox One X, allowing you to play movie discs in glorious 4K UHD resolution. The Xbox One X costs £450/$500 with a 1TB HDD. For comparison, the Xbox One X with a 500GB drive costs around £225/$250, and the PlayStation 4 Pro costs £350/$400. It’s likely there will be bundle deals for the Xbox One X with one or two games. Microsoft has always marketed Xbox One X as an elite product for true enthusiasts and that’s exactly what it is. The technology and engineering are extremely impressive, providing some truly superlative visual experiences – it’s the closest the current generation gets to a decent gaming PC in console form. However, most gamers will be satisfied with the 4K performance they’re getting from the Xbox One S or PS4 Pro, while anyone who still feels satisfied with their 1080p HD display is probably not going to be seduced by what the Xbox One X has to offer. 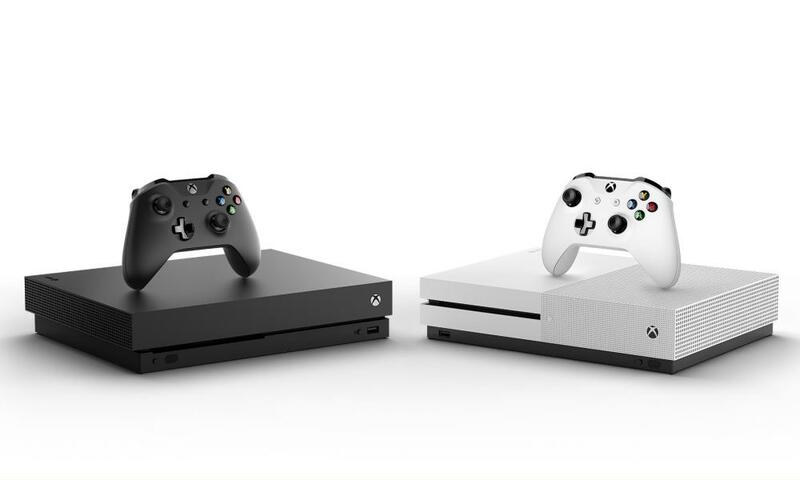 If your decision is about upgrading from an Xbox One or Xbox One S, it would be smart to wait a while and see just how enthusiastically developers support the new machine. Currently, Microsoft says around 150 titles are getting enhancements for Xbox One X (including both forthcoming titles and legacy favourites like Witcher 3 and Final Fantasy XV), but these will vary enormously in scope and ambition. If you’re a PS4 owner tempted by the “most powerful console ever made” shtick, have a good look at the exclusive titles coming to both machines and ask yourself what you want to play. It’s not all about visuals after all.